Our small company started off in the late 90’s. Paul, then an employee with a leading cigar company, decided to follow his dream and open up his own cigar making facility. Backed by years of experience and loads of passion on the subject AMCO cigars open the doors a year later. Back then, the company was only producing Senorita sized cigars, namely the Sumatra and Brazil Senorita range, Jean De La Vallette. The first target was the domestic market, which the product quickly penetrated and became one of the favourites with the locals in bars, pubs and restaurants. The product quickly built up a reputation of high quality and superior taste which only Sumatran tobacco can offer. Apart from the locals the product also started gaining popularity with tourists who visit the island in the summer months. Being available in most leading souvenir shops our products became a hit with the foreign visitors. This flagged up the idea of extending our market to our foreign clients, both through online sale and agents. The idea was further consolidated by the Launch of the Cavaliere cigarillos range. This range has both natural and flavoured products with the Vanilla Cavaliere cigarillos being the most popular of the whole lot. To compliment our product range The Wilde Cigarillos and Half Corona were introduced. These could be supplied in boxes and even individually wrapped. The cigar making procedure starts first and foremost with the tobacco selection. This is the most important part of the whole process as on it, depends most of the taste aromas and overall cigar qualities. The leaves are harvested, dried and sorted according to size, structure, quality, colour and strength. The next step is the important fermentation process where the leaves acquire their taste and aroma. The leaves are again sorted to be used as filler, wrapper or binder tobacco. The Filler of our cigars is composed of a BLEND of short pieces of tobacco leaves combined together to create a particular taste. Each cigar has its own characteristic secret BLEND. The filler is kept together by means of the Binder. 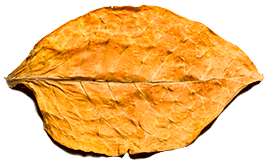 This leaf is HARVESTED from the upper part of the tobacco plant and selected by us for its physical strength. The binder also affects the taste of the cigar so it is chosen to complement the filler mixture. Finally, the most important layer is the Wrapper. This is smooth, with no protruding veins and is known to account for 60% of the cigar’s taste. We only select top class wrapper leaves which round off the other two layers to provide cigars of an authentic quality and unique taste. The selected tobacco is then shipped to our facility and stored in controlled environmental conditions. Shortly after leaving the machine the cigars are oven dried to reduce moisture, pasteurise the tobacco and prolong shelf life. After drying, all the cigars pass though our rigorous quality control process. Here only the products which meet the right specifications regarding weight, size and overall aesthetic quality make it through to the final step. They are then placed in their corresponding box with the right labels and sealed tight. Being a plastic box and sealed in airtight cellophane prevents moisture transfer thus preserving the taste and aroma for a longer time. The package also protects the contents from accidental damage. All products are stored in controlled atmospheric conditions ready to reach our customers across the globe.